As Hurricane Lane pushes toward the Hawaiian Islands you may know people planning to travel to or from the islands and are wondering what they can do to prepare. Late Wednesday evening phones were still ringing at America Asia Travel Center in Las Vegas where Iris Zhang is a travel consultant. "Our company has arranged a lot of the tour packages going to Hawaii," Zhang said. While Zhang is busy, she said its not because Hurricane Lane barreling toward the Hawaiian Islands has people canceling their trips. At least not yet. "We suggest the passenger watch the weather," Zhang said. 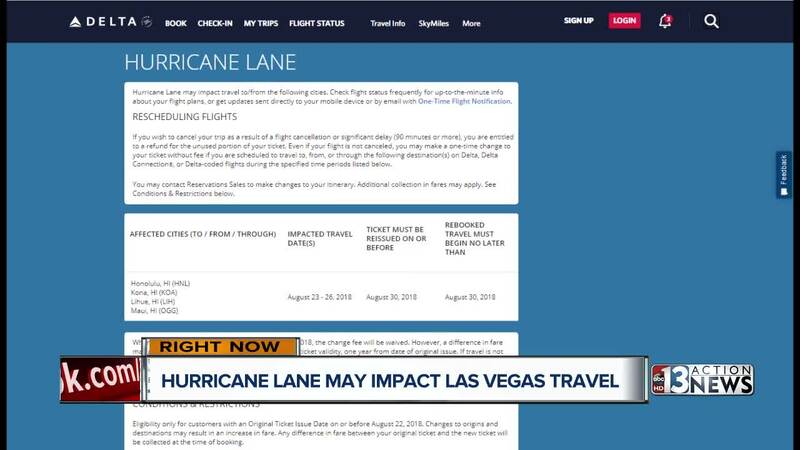 As of Wednesday evening, no flights leaving McCarran Airport had been canceled and flights from Hawaii were still arriving in Las Vegas. The major airlines have started posting travel advisories and relaxing their rules on change fees for flights in and out of Hawaii. They include Delta, American, Hawaiian, Alaskan and United. Hawaiian Airlines posted a message telling customers the call hold time is longer than usual because of the sheer number of calls and suggesting customers only call if their flight is within the next 24 hours. This is a situation in which Zhang said travel insurance could come in handy for some people. If you purchased it before Hurricane Lane became a named storm last week. It may also cover expenses if your flight is canceled or if you arrive in Hawaii and your hotel is evacuated because of the storm. Even if your flight has not been canceled yet keep in mind some tourist spots may already be closing as a precaution.